Method, which uses a laser to identify viable sperm cell, recommended in MESA/TESA IVF cycles or in patients diagnosed with sperm immotility. Method, which uses a laser to identify viable sperm cell for subsequent ICSI, recommended in MESA/TESE IVF cycles (surgical sperm retrieval) and any other cases of immotile spermatozoa (severe asthenospermia or necrospermia). Sperm viability is a prerequisite for a successful ICSI treatment, because the injection of a nonviable spermatozoon into an oocyte generally results in fertilization failure. Normally, the spermatozoa are selected according to motility, which is a clear indication for viability. However, in cases with complete asthenozoospermia, it is impossible to select viable sperm by morphological means. 2. the spermatozoa show no reaction at all. Spermatozoa showing a curling reaction are considered to be viable and can be used for ICSI treatment immediately. In contrast to another methods e.g. hypo-osmotic swelling test, the laser selection can be performed directly in IVF medium with no additional micromanipulation. ICSI with laser selected sperm increases the probability of oocyte fertilization in patients undergoing surgical sperm retrieval (MESA, TESE), or in patients diagnosed with sperm immotility (asthenozoospermia, oligoasthenoteratozoospermia, necrozoospermia). 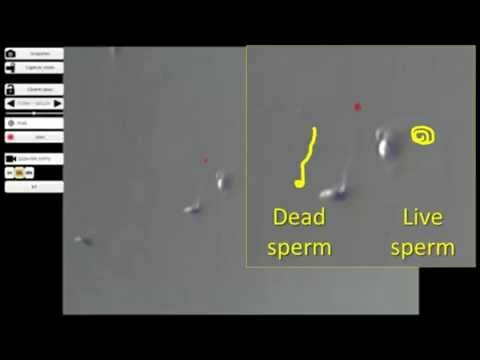 Laser sperm interaction allows for the identification of viable but immotile spermatozoa. LAISS is regarded as a safe procedure since a shot applied to the far end of the flagellum does not affect the sperm head containing the genetic material. Moreover, this novel technique used in a specific group of patients increase the chance to select viable spermatozoa capable of fertilization. The fertilization rate with immotile, but vital spermatozoa clearly benefits from laser selection and is a non-hazardous and safe method for the selection of viable but immotile sperm.